WHEAT RIDGE, Colo. — Her mission to get to a safe place landed her in Colorado away from a dangerous man. Now she's helping others in similar situations. 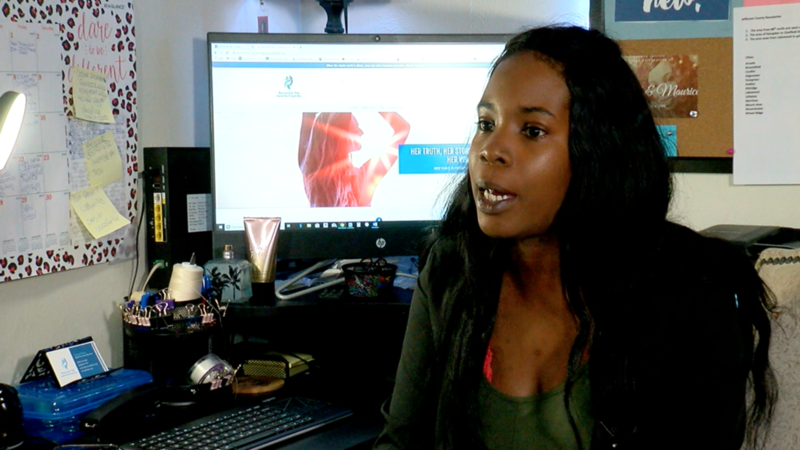 In December, Chanel Davis reached out to Contact7 to share her brave story and detail her struggle to find a safe haven. After hearing her story, the community and local law enforcement stepped up to make sure she was able to celebrate the holidays the right way. "I feel really good. I feel great. I feel like the old Chanel is back," Davis said. "I'm so excited. This has been my passion forever." After living on the street and escaping a violent relationship, Davis is now the executive director of Voices for Her , a nonprofit group empowering abused women to get back on their feet. "Basically I'm here to mentor women, give them that sense of encouragement, that sense of empowerment to get their life back and get their voices back, " Davis said. Davis has been there. When we met her in December, she told us how she lived with a man in Chicago who had beaten her on a daily basis. One night she'd had enough. "I was raped and he went to sleep. When he was asleep I grabbed my kids and just left," she said. Davis fled to Denver, living in homeless shelters and her car and working odd jobs to feed her four kids. Wheat Ridge police saw our story and joined forces with Santa to give Davis and her kids a merry Christmas. She says that day changed her life. "I just want to thank Denver7 so much. You guys have been such a blessing to me and my children. You guys gave me the power to speak up and bring Voices for Her to life." After our stories ran, Davis said people stopped her in the grocery store to tell her their stories of abuse. That gave her the idea to start Voices for Her. She started passing out fliers to attract fellow survivors who needed a helping hand. "Gas stations, restaurants, bus stops, stuff like that. Just put my flier out and people called," she said. Since February, she's spoken with more than 50 abused women on the phone, through email or in person. She offered them advice on everything from shelters to how to navigate the system. She has countless "thank you" messages, including one from a woman who called her a "godsend." "I'm going to be that woman that says nope, I'm not going to wait for someone else to do it," Davis said. "I'm going to stand up and do it on my own. I'm going to get up and say, 'It's time for us to stand up and I'm here.'" "All of us are on Chanel's team. All of us," Lewis said. "She is a phenomenal role model for so many survivors to know they can cross over and be at that place." And now with her calendar full at her home office, Davis says her work is just beginning. "I'm not going to stop. I'm going to keep going. Voices for Her is here and it's staying, and it's going to get bigger and bigger as the years go on." Davis says she's looking for sponsors and applying for a grant. She hopes to hire an assistant soon. April 7th at the Lakewood library, Davis is hosting her first big event for women affected by domestic violence. The event is free. It's called "You Go Girl." The library is located at 10220 W. 20th Ave in Lakewood. RSVP though Cdavis@voicesforher.org or by calling 303-736-9352.